This post is written using Microsoft PowerPoint 2010. For steps on how to achieve this using Microsoft PowerPoint 2016 please see this updated post. This week I saw a great question on an online forum relating to Microsoft PowerPoint. The question asked how to make an object appear on screen for a few seconds, and then make it disappear only to be replaced with a different object. I’ve been asked about this one many times during training courses and it really is a nice easy task to do, so after answering the question I thought I’d create a post about it. 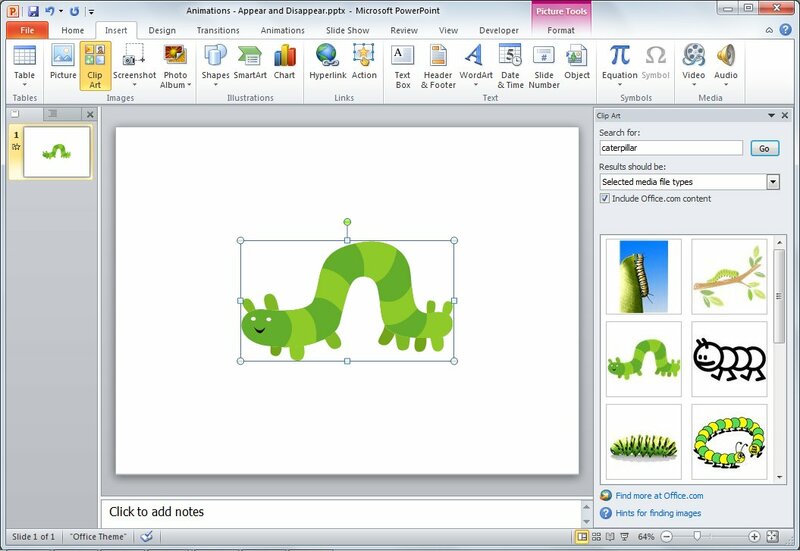 Using Animations in Microsoft PowerPoint can be lots of fun and allows the creative juices to flow. 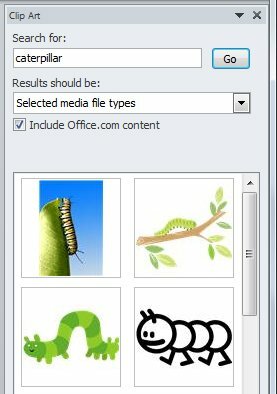 Having conducted professional development for teachers over the years there are some really great ways that teachers and students can use PowerPoint and in particular, animations in the classroom. Animations are a great way to make any presentation interactive and dynamic. There are four (4) different types of animations: Entrance, Emphasis, Exit and Motion Paths. The type of animation you decide to use is directly related to what you want the object to do. Do you want an object to appear or disappear? Then you will need an Entrance or Exit effect. Do you want it to be highlighted or accentuated on the slide? Then you will need an Emphasis effect. The Motion Paths effects provide great flexibility to essentially do whatever you want including making a turn, looping and creating your own custom path. There is such a thing as “too much of a good thing” when it comes to animations. 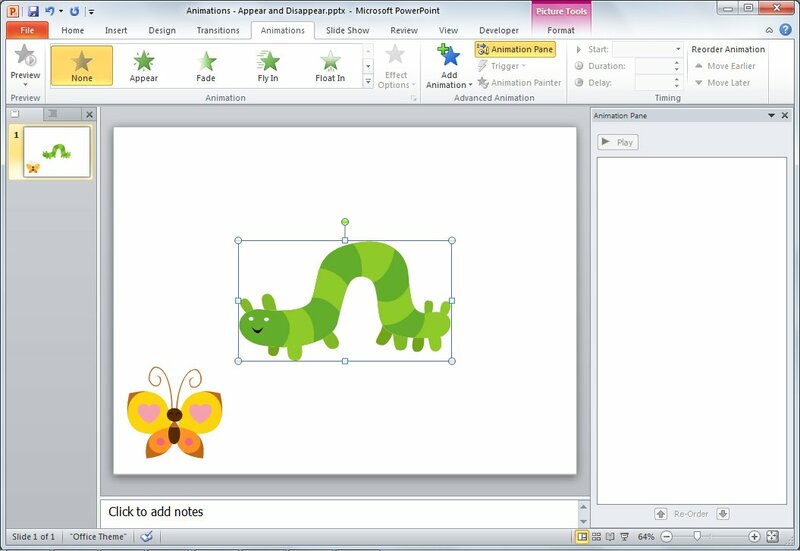 I can definitely say that I’ve seen some terrible examples of how to use animations in Microsoft PowerPoint. While it is a great feature, I always give this little “disclaimer”. While animations can really improve the readability and retention of information, too much will make your audience feel like they are watching the latest creation from Disney Pixar. Too much is never good, so try to keep the number of things or text you animate to a level which will not leave your audience looking confused wondering where the next piece of information is going to fly from. The Animation Pane allows you to view all objects on the slide which have had an animation effect applied. I find the Animation Pane gives you a better view of what is animated and when it will run and is great for troubleshooting issues. In order to see the Animation Pane on screen, you must click a button for it to be displayed. I’ll show you how to do this a little further down this post. 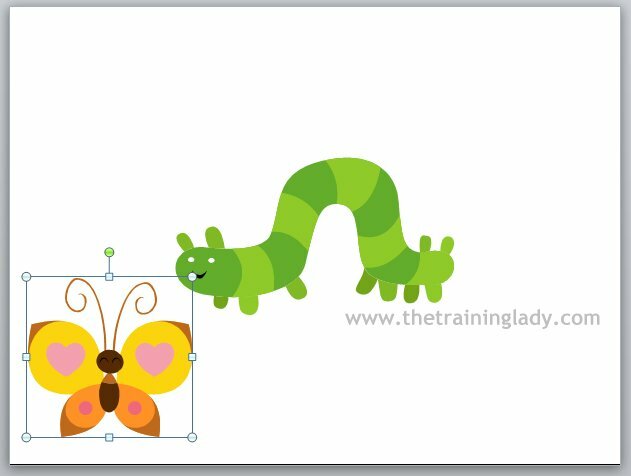 For this animation sequence, I am going to have an image of a caterpillar turn into a beautiful butterfly, this is inspired by my daughter’s recent “life cycle of a butterfly” presentation she did for news. 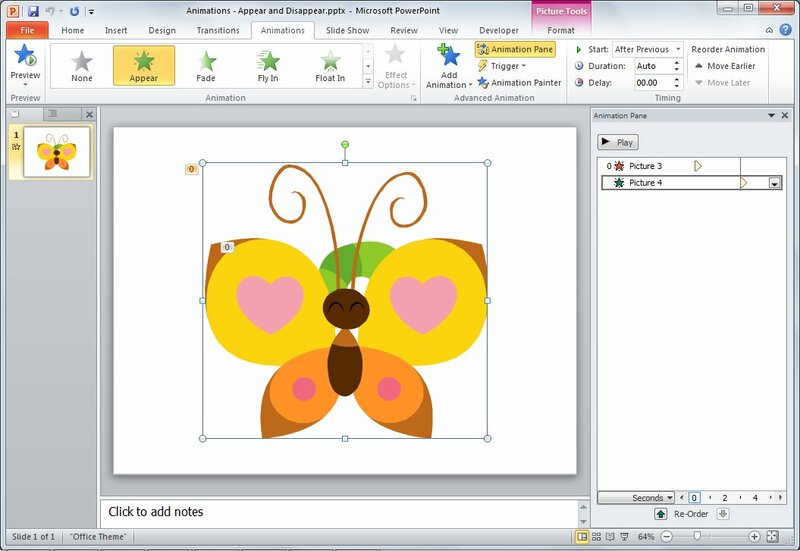 So let’s take a look now at how to work with animations in PowerPoint to achieve our goal. Let’s be specific about the type of media we are looking for, performing this extra step can mean less time to scroll through the results looking for what you want, I’m all for efficiency! Animations all rely for the most part on the timing settings. Timing includes us specifying when an animation should begin, how long we want it to last and if we want any delay used. On Click Will begin any animation sequence once the mouse is clicked or a key pressed on the keyboard whilst in slideshow mode. After Previous Will begin once any previous animation effects have completed. Starting slideshow mode is also considered a “previous” effect. With Previous Will begin at the same time of any previous animation effects. Starting slideshow mode is also considered a “with previous” effect. A common question I get at this stage during a training day is “Why are we using After Previous when this is the 1st item in this sequence?” That is a valid question and as I’ve outlined in the table above, PowerPoint recognises that when we start a presentation in slide show mode that is the “previous” effect so it will automatically start an animation without us having to click. 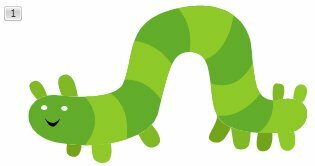 For the Duration option we need to set how long we want the animation to take, so in this case, how long till our caterpillar disappears? I highly recommend you explore the animation options available and of course, if you have any issues or need assistance do not hesitate to contact me via the Contact Me page or via Facebook or Twitter. Enjoy.